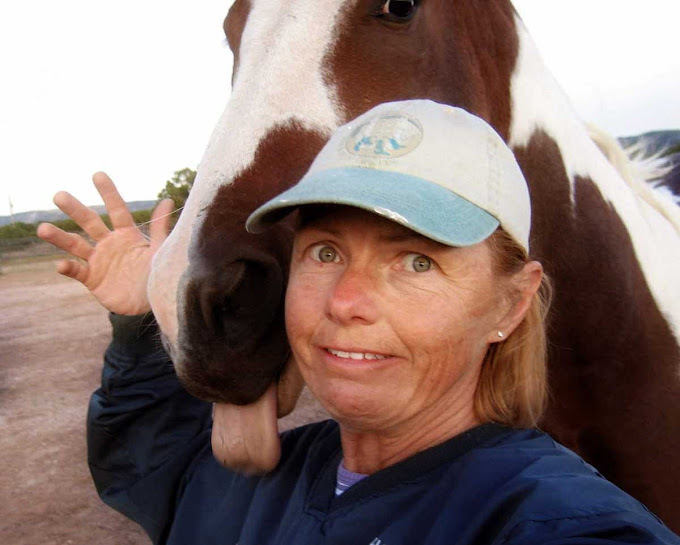 The 7MSN Ranch: Let's post some embarrassing self-portraits, shall we? Let's post some embarrassing self-portraits, shall we? It was Tuesday afternoon around 3:00. A big ole thunderstorm blew on through and, of course, the power went out at the 7MSN. Instead of getting all stressed out about the work I couldn't do and the e-mails I couldn't answer, I said to hell with it and went outside to hang out with Lucy and the boys. It was too nasty to take the good camera, so I took the new point-and-shoot – the one with all the silly pre-programmed modes I thought I would never use. Me: Hey, Lucy. Here's a setting called self-portrait – "lets you take a picture of yourself while holding the camera" it says. Let's try it. Lucy: Stupid camera. It cut off my ears. Send it back. Me: Don't be so quick to judge. I think it captured your smile quite nicely. And try we did. I have a bazillion pictures of my animals, but almost none of my animals and me together. 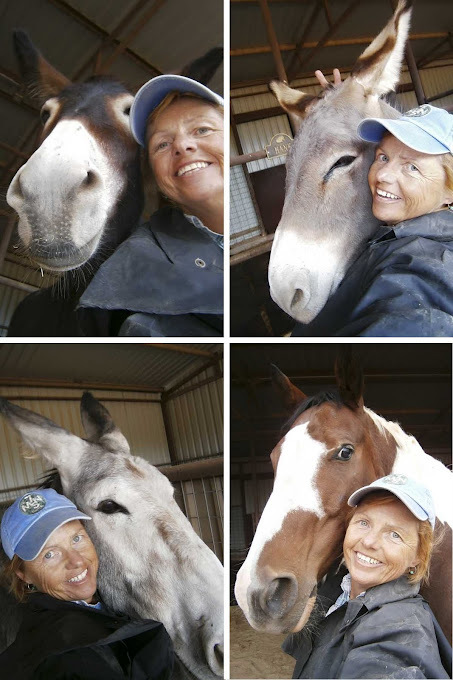 I was determined to get one self-portrait with each of my equines where we both had our eyes open and that was in focus. Next time I try this I should probably think about combing my hair, losing the baseball cap and not wearing a muddy raincoat. At least nobody stuck their tongue out this time. I love the direction of Lucy's whiskers, but she is correct, here ears are a must for a self portrait. ...and raincoat and hat can't hide your beautiful baby blues! Love 'em!! No worries about the hat and coat. In my opinion it's all about the smile and yours is a megawatt one! I love the photo of you and Lucy, WITH the ball cap, messy hair, and muddy raincoat ... it's REAL, and Lucy is beautiful. This one is a keeper! The kids take pics of themselves and each other, this way, all the time. I've only done it a few times. Everyone is saying "cheese"! Looks like lots of rainy day fun at your house. Did you have to get down on the ground with Wynonna? You and George, so cute! This is such an interesting glimpse into rural pastimes, 7MSN-style. I think by the look on Hank's face he was wishing he had stuck out his tongue, hee hee!!! Perfectly fun way to enjoy the lack of electricity. I'm waiting on shots of you and the females in your family (cats, pig, Smooch). Carson, you and Lucy just made coffee shoot out of my nose all over my keyboard. At work. I enjoy all of your posts but this one is the tops. Does George know he got another pair of "ears" in his photo?!?! BIG GRIN!!! LOVE IT!!! And now I have a big smile on my face! Could be fodder for a new header gallery! Love them, messy hair and muddy coat and all! After all, it wouldn't be the MSN if it weren't au natural. Love that first photo. Lucy's whiskers are fantastic and her nose is just so... strokable! My favorite is the one with the tongue hanging out. 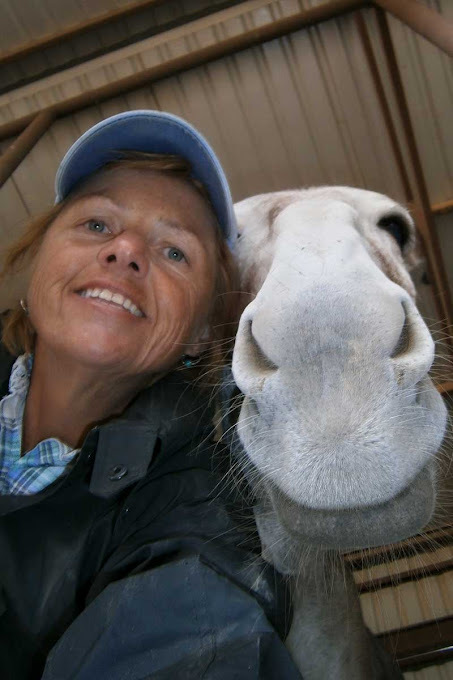 We have miniature donkeys so I would have to get down on my knees to get a shot. I am going to try it though. Great--love them!! Always experiment Lucy!! What fun! I love them all. Love it! Baseball cap, muddy raincoat and all. I agree w/what Breathe said - it's all about the smile! That's a good little point & shoot. You're so stinking crazy! Love every one of these photos. Posing with donks looks like fun, but Hank is just sooo handsome, I wouldn't want MY picture taken with him unless I was wearing a party dress and had my hair done. Nice fun for a rainy day, since your buddies - smart as they are - don't play card games or Monopoly. Self portraits are so much fun, and I had a lot of fun looking at yours! Thank you. Don't you change a thing! You and your animals are beautiful! I think the self portrait photos with the family was a great idea - muddy raincoat and all. What a hoot. I feel the need to get one with my cat, now. Fantastic! Of course I particularly like the last one. Hank is such a gentleman :P.